2 Because ELF fields tend to overpass obstacles, the ELF protection has to be much bigger than the size of the source, so when the ELF field will eventually pass it they will be very week. Before installing the ELF protection you need to design the protection according to the type of source and the structure of the rooms. EMF and to find all sources and penetration points. ELF shielding should be used to keep the ELF from outside entering your house. Most type of ELF Sheffield will block and reflect also RF radiation. If you use RF emitting devices in side the shielded area you risk that the RF will bounce back from the shielding. Therefor, when ELF shielding is used, we believe you should not use any wireless devices in side the shielded area. Because ELF fields tend to overpass obstacles, the ELF protection has to be much bigger than the size of the source, so when the ELF field will eventually pass it they will be very week. Before installing the ELF protection you need to design the protection according to the type of source and the structure of the rooms. Since some of the ELF magnetic will pass the protection, it is recommended not to place sitting or sleeping area right next to the protection, but to keep a safety distance of at least 50 cm from it. 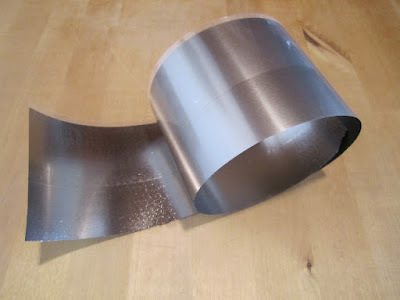 This foil is very flexible but very expensive (expensive compared to RF blocking foils and also to other ELF shielding material). On the other hand it is very easy to handle and can be trimmed by a pair of home scissors. It can be applied on walls and needs to be grounded. It is usually used as an additional protection after ELF blocking metal panels or when there is a need for a small, light and flexible solution. This foil is uses usually to block ELF magnetic fields in medium and low levels of between 20-2 mG. For higher levels you need to apply to lairs of this foil or to use additional metal plates. The ELF magnetic fields blocking metal plats are similar to the ELF blocking foil, but they are not flexible and usually used only in the professional market. In order to install it and to apply it on walls you will need to drill holes and to screw the plates into the wall, ceiling and floor. The plates are heavy and are made from a verity of metals with different magnetic characteristics. There is usually the need to use several layers, each on with different magnetic polarization. Some of the materials blocks and some observed the ELF fields. These plates are more expensive from the ELF blocking foils and are usually used to block high magnetic fields between 20-200 mG and more. ELF blocking Active systems – used in order to block a low-frequency electromagnetic radiation field and to lower its level in a given point, but this is done by creating a second field in the same strength and in opposite direction to the one that was already there. In the point in which both fields are in the same strength you will be able to measure magnetic field of 0 mGause, but if you move towards one source (ELF original source or the active ELF blocker) the ELF levels will go up, they will still be lower than the original ELF source levels, but now they will be a mathematical sum of the two fields which are in opposite directions. This active system does lower the measured levels but I don’t think this actually reduce the health risk. I think it might even increase it since now your body is exposed to more fields from several directions. We don't recommend using an ELF active protection system. Dirty electricity is a mid-frequency electric current noise (100- 100000Hz) that is carried over the electricity wires in your house and that is generated by electronic devices, electronic power converters RF equipment or external sources. The noise is carried around the house over the electricity wires and since the frequency is relatively higher the magnetic fields created by these currents mange to be emitted into the room itself and can be measured even 2 meters from the walls, in the middle of the room(compared with 50 or 60 Hz single that can be found and metered usually only very close to the wires, usually note more then half a meter). The Dirty Electricity filters cut off these frequencies and ground them, so only the 50 or 60 Hz signal can be found on the wires. 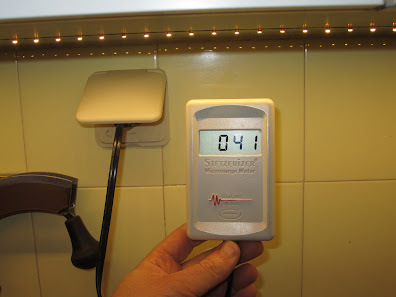 Therefore they limit the danger of exposure to the LF magnetic fields in your house between 100-100000Hz. As a byproduct, the filters emit low-level ELF magnetic fields around them. These filters should not be installed next to places where people stay for a long time. Usually, 1-meter safety distance should be enough (sometimes more for EHS people). It is recommended to test for dirty electricity (DR), with a special numeric meter, before buying any filters. It is also recommended to try and find the sources of the DR and to limit their use before installing the filters (in order to limit the number of the filters needed and by that saving money). 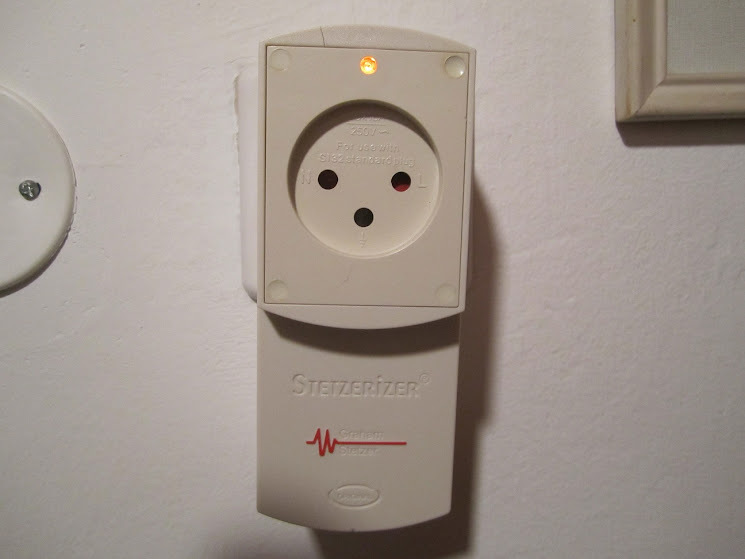 The installation is very simple, just plug it into the electric power socket, and it is on. I use them at home and in my work and they make me feel better. I remember having a burning sensation in my eyes after I moved to a new office. One day I brought my DR meter and one filter. The meter showed 1500 GS units. This burning sensation disappeared a few minutes after I installed a single filter (level went down to 75 GS units), and returned few minutes after I uninstalled it.